A step forward? Gigabyte belongs more to the unknown mobile end device suppliers in some countries. Too bad actually, considering that the Taiwanese manufacturer has a few very exciting laptops in its product line. For example, the U24T is seen as a compact multimedia all-rounder. The name U24 seems very familiar to us, just like the silver chassis. After all, we tested the identical precursor dubbed U2442N about a year ago. The bundle sounded interesting at the time: Intel Core i5 CPU, GT 640M GPU and a 14-inch HD+ screen. Our verdict about its performance was throughout positive. However, the device had shortcomings in materials, keyboard, screen, and speakers. Now we are testing a completely refreshed edition in terms of innards, comprised of Intel's i7-4500U, Nvidia's GT 750M graphics card with 2 GB of DDR 3 video memory, 16 GB of working memory, and a HDD/SDD array. Besides that, our review sample uses a touchscreen in HD resolution. The only, currently listed version sold in Germany features an i5-4200U CPU, 8 GB of working memory, and a matte HD+ screen with specs that apparently match those of its precursor. The estimated price for this configuration: a steep 1299 Euros (~$1779). While buyers still seem to favor 14-inch casings in the Far East, the products are invariably concentrated in the 15.6- and 13.3-inch range in other regions. Possible contenders in this size would be Sony's Vaio Fit SV-F14, Lenovo's IdeaPad U430, or even Schenker's S413 (Clevo 740SU). All devices are slim 14-inchers that provide an extra shot of graphics performance. As mentioned in the intro, the present casing is likely the same chassis that was used for the precursor. The surfaces have a plastic feel to them, although the stiffness is quite good. 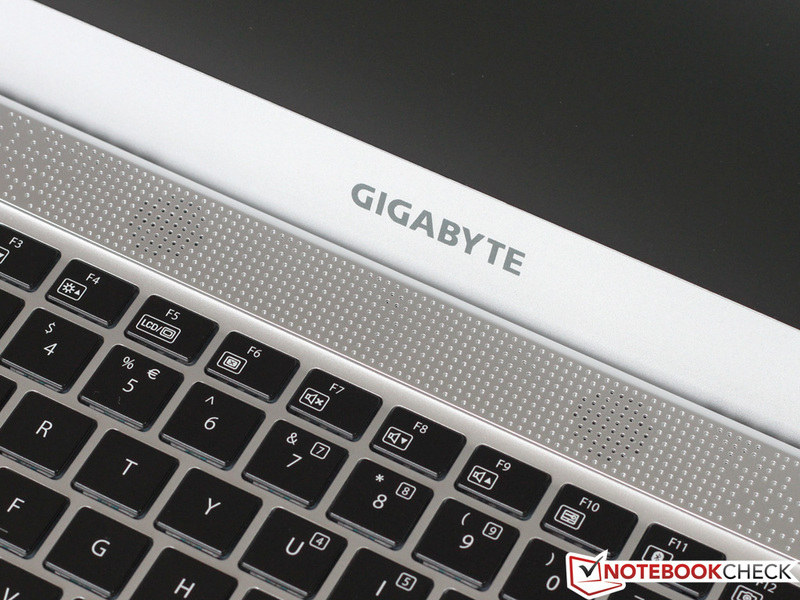 It is well possible that Gigabyte relies on a special mix of materials, such as magnesium. The build is also overall satisfactory. With a weight of 1780 grams, the U24T is a bit heavier than its precursor (1.69 kg). This could be in favor of the battery that now has a capacity of 47.7 Wh according to the specs; that is almost 10% more than in the former model. 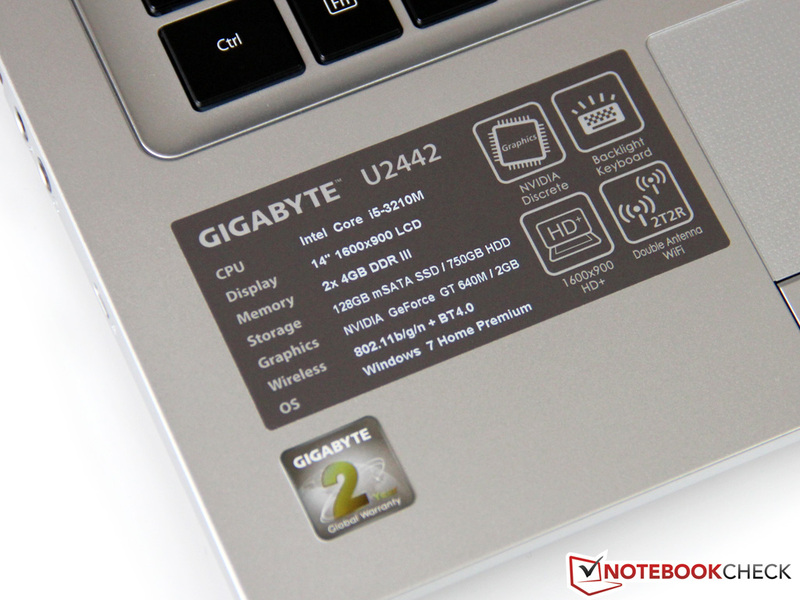 More details about the casing can be found in the review of Gigabyte's U2442N. The installed interfaces have been completely adopted. 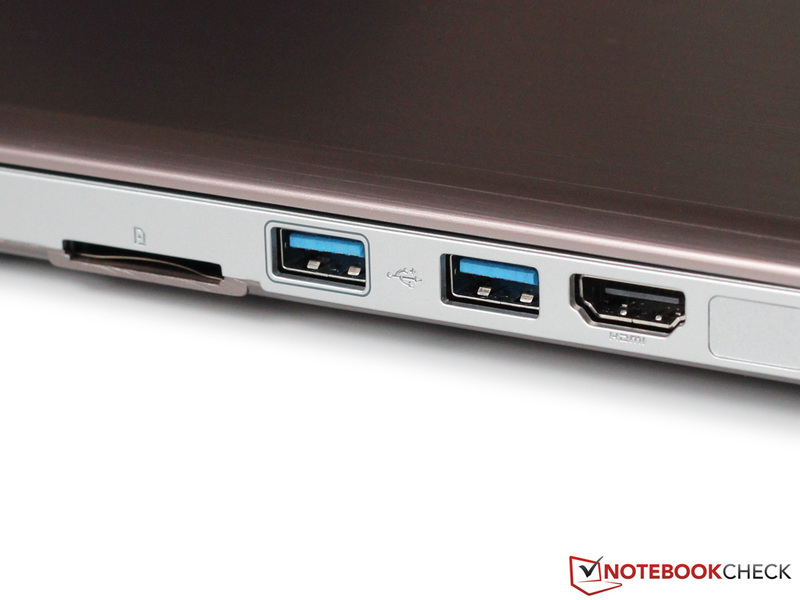 2x USB 3.0 and 2.0, alongside HDMI, VGA, and LAN cover the needs of most home users. Alongside the new hardware basis inside, a new Wi-Fi module is also used. Like its precursor, Intel's Wireless-N 7260 BGN 2x2 module only transmits in the 2.4 GHz band and integrates Bluetooth 4.0. The author did not notice any irregularities during the Wi-Fi reception test in his individual infrastructure. Like in the precursor, the user is treated to a leather bag as a free goody for the Gigabyte U24T. 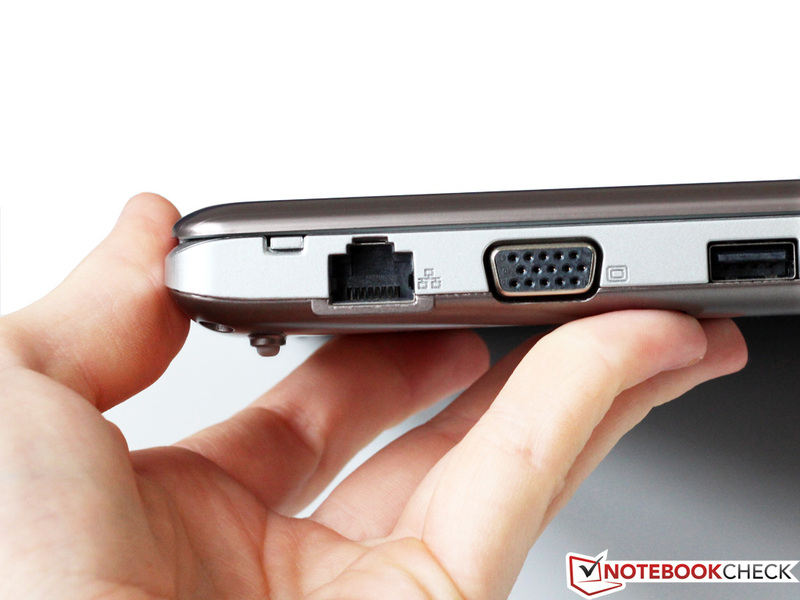 As to software, we find apps like Cyberlink's PowerDVD 10, and the known Adobe Acrobat Reader. Gigabyte also enables accessing reboot and shutdown functions quickly via an icon in the task bar. The same chassis, the same keyboard model: Like in the precursor, we like the tightly fitted keyboard unit. A two-level keyboard light facilitates typing in the dark. Again, we noticed the soft pressure point, but whether that is good or bad is a matter of personal preferences. 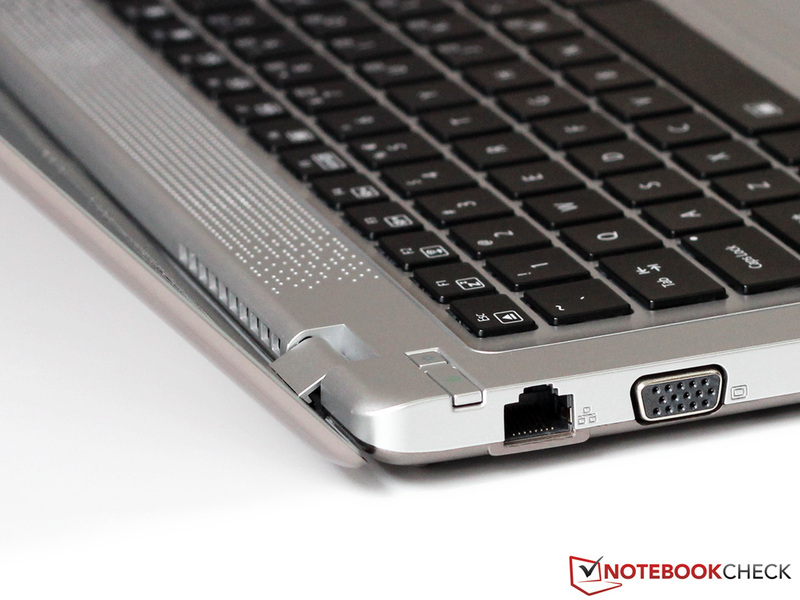 More information about the keyboard and touchpad can be found in the review of the precursor. Here we find the first significant difference in our Gigabyte U24T compared with its precursor. 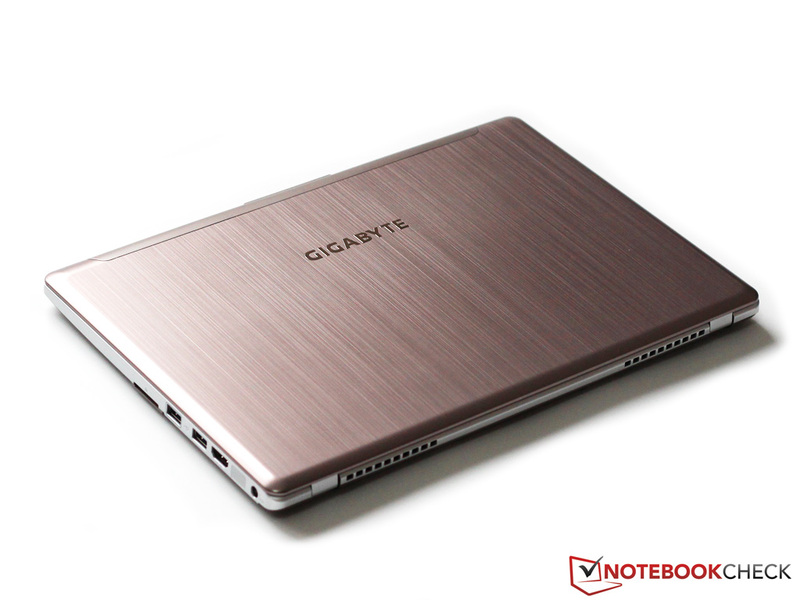 Gigabyte uses a glare-type touchscreen with a resolution of 1366x768 pixels in our model. 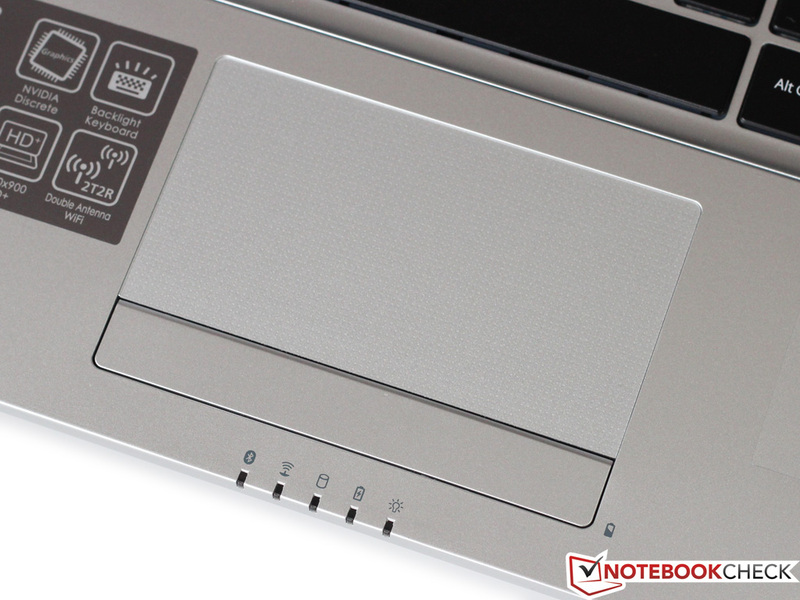 This is likely the price for the ultrabook sticker on the wrist rest (touchscreen is a requirement for Windows 8). However, it is yet unknown whether this version will be available in Germany. Gigabyte specifies the HD touchscreen as the only configuration for the U24T in various spec sheets though. A loss in resolution opposes the gain of the touch feature compared with the precursor. 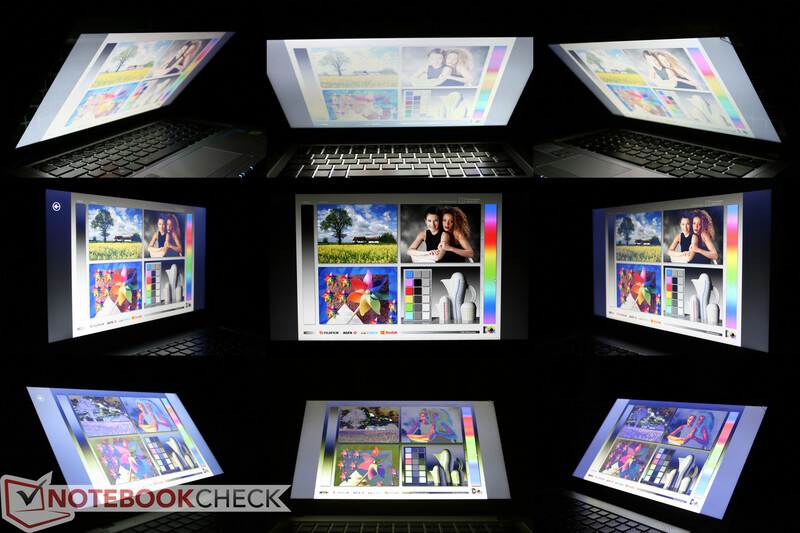 Although 1366x768 pixels can still provide sufficient image sharpness on a 14-inch screen, the user will notice the reduced overview on the screen when working with multiple open windows. However, we deem the screen's lower brightness more painful. 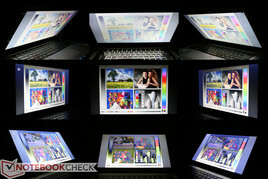 A maximum of 186 cd/m² in the screen's center is no longer appropriate for a modern laptop screen, in the author's opinion. The illumination is very homogeneous though; no visible, irregular spots from the display illumination shine through on the screen even in very dark content. 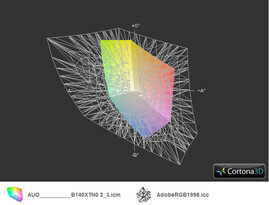 The screen's maximum contrast of 716:1 is satisfactory owing to a low black level of just 0.25 cd/m². Nevertheless, the image could not excite us subjectively. First, we were always faced with intense reflections due to the screen's middling brightness, and second, the screen's viewing angle stability is quite limited. The screen's color reproduction is not a reason for joy either. 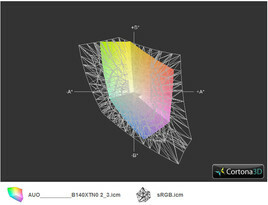 With a DeltaE of 11.66 in ColorChecker and 12.39 in Grayscale, the color reproduction of Gigabyte's U24T deviates clearly and visibly from the ideal value. 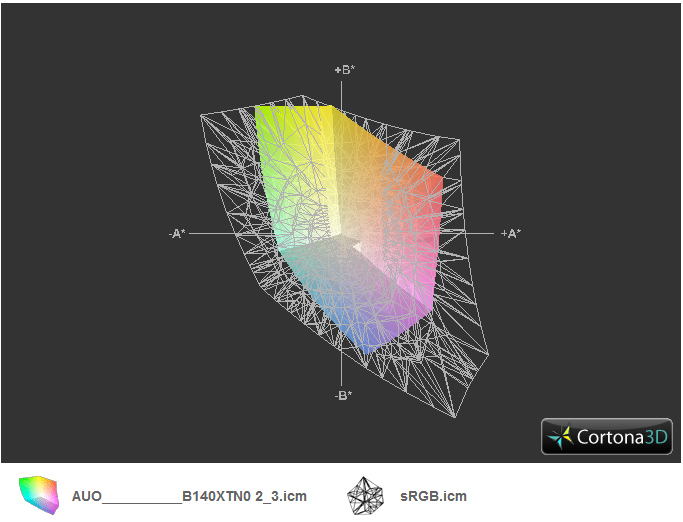 The touchscreen in Gigabyte's U24T does not stand out in the reproducible color space either. The screen is far remote even from the sRGB color space. Our last point of criticism concerns the presented viewing angle stability. While an increasing number of viewing angle stable IPS screens are found even in lower-priced laptops based on touch-technology, Gigabyte digs into the spare box and installs a conventional TN screen, which is not necessarily from the premium range as our measurements confirm. The available viewing angle stability is also very tight. The slightest deviation from the ideal, perpendicular viewing angle is enough to provoke either image changes (vertically) or intense reflections (horizontally). The screen scores poorly in viewing angle stability. It is not as much the i7-4500U CPU that rouses interest, but the graphics card installed in the slim 14-inch laptop - Nvidia's GT 750M. That is enough for a scrutinizing, second glance. The GPU from the upper mid-range generally provides enough performance reserves even for current games; it is a very exciting argument paired with the light and compact casing's good portability. 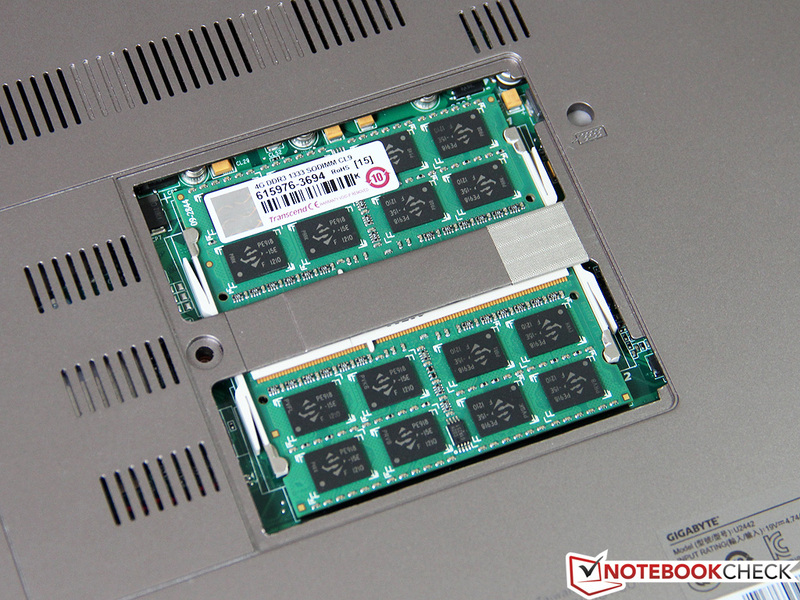 Our review sample's generous 16 GB of working memory might look nice on the spec sheet, but the user should not expect a real advantage from it, except for in special applications. We deem the storage device point well-solved. The combination of an SSD for the system partition and a conventional HDD for data storage fuses the advantages of both technologies. 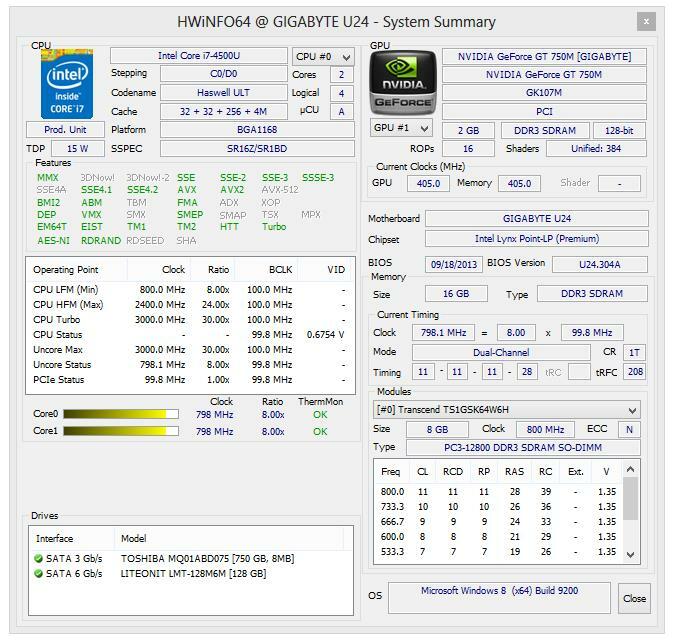 Intel's Core i7-4500U is not an unknown chip and it is currently used quite frequently. The processor comes from Intel's latest Haswell generation and is built in 22 nm. Besides that, it also incorporates Intel's HD Graphics 4400 GPU that stands out with low power consumption. The chip has a TDP of 15 watts, and clocks with 1800 to 3000 MHz according to Intel's spec sheets. We achieved 1.32 points in the single-thread test of Cinebench R11.5, which is on the expected level for this CPU. The chip reached its maximum specification of 3.0 GHz for a short time in this test. Intel's i5-4200U, which is also listed in configuration options of the U24T in Germany, lags behind by approximately 10-15% in this test. The chip clocked both cores with 2.7 GHz in Cinebench's multi-thread test and achieved a score of 2.64 points. This result also correlates with our observations based on other laptops with an identical CPU. Intel's i5-4200U lags behind by 5-10% in this test. The i5-3210M CPU used in the precursor is roughly on par with the current i7-4500U chip, but has a TDP of 35 watts. Gigabyte's U24T manages similar rates in both battery mode and AC mode. 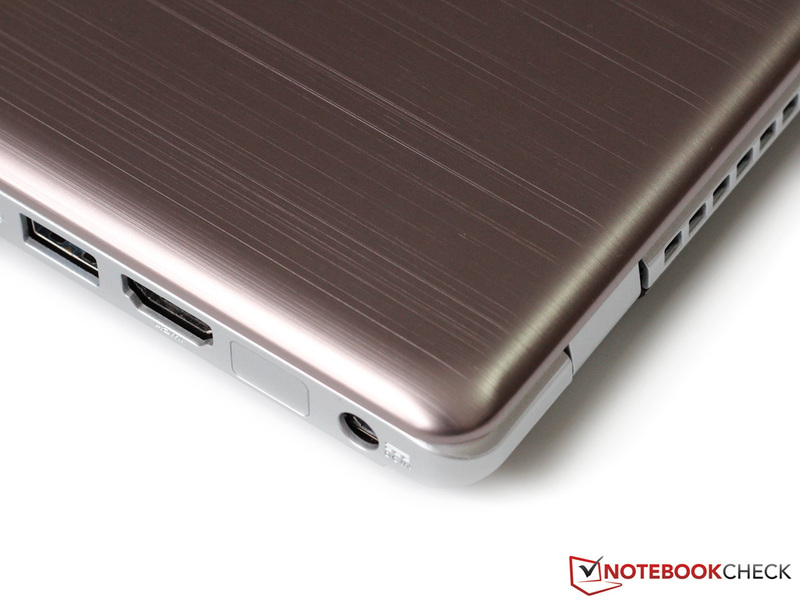 Consequently, the processor's full computing power should be available in battery mode. We used PCMark 7 here since we could not start PCMark 8 error-free. Experience shows that PCMark 7 evaluates the installed storage device a bit harder than the PCMark 8 successor. 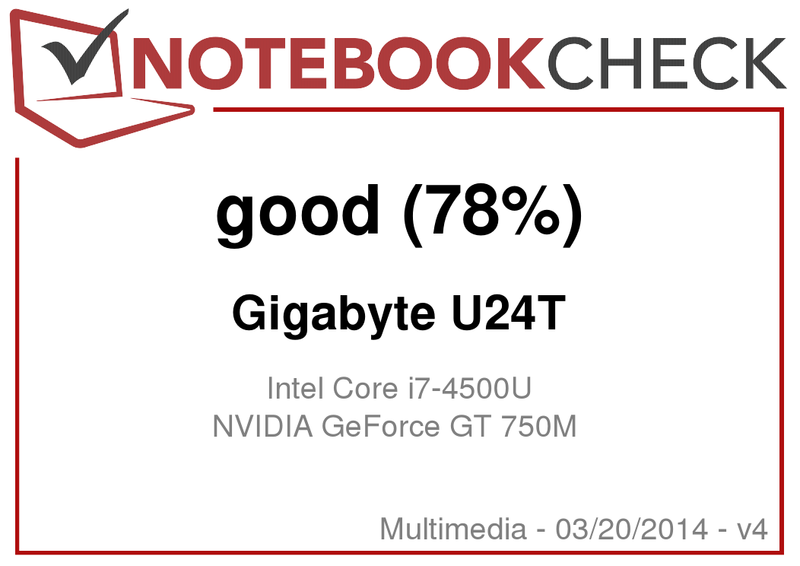 Gigabyte's U24T delivers a very good score of 5441 points and is in the top ranks of our tested laptops. Dell's current Inspiron 15 based on similar hardware (4500U, GT 750M) is on par, except for a few points. Gigabyte's identical precursor (3210M, 640M) achieves 3667 points in this test, and thus lags behind by approximately 33%. 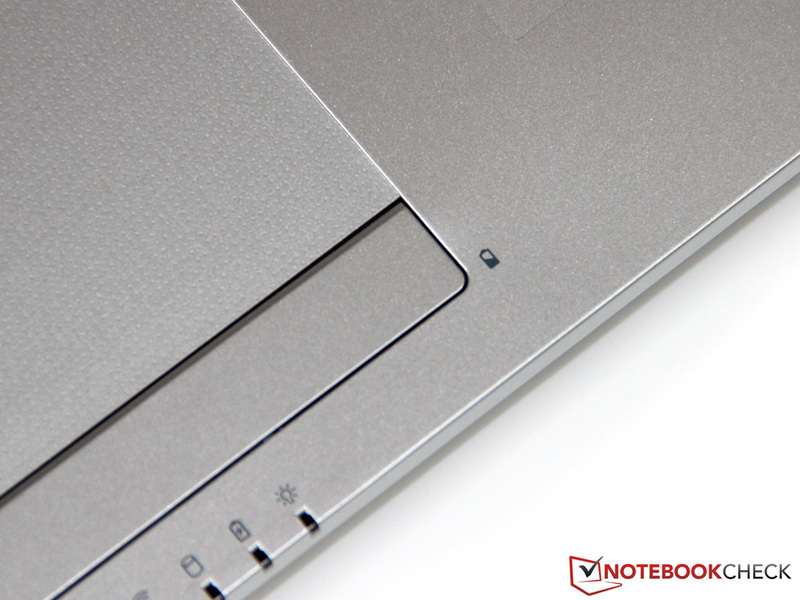 Sony's Vaio Fit SV-F14 clearly remains behind, but it does not sport an SSD. 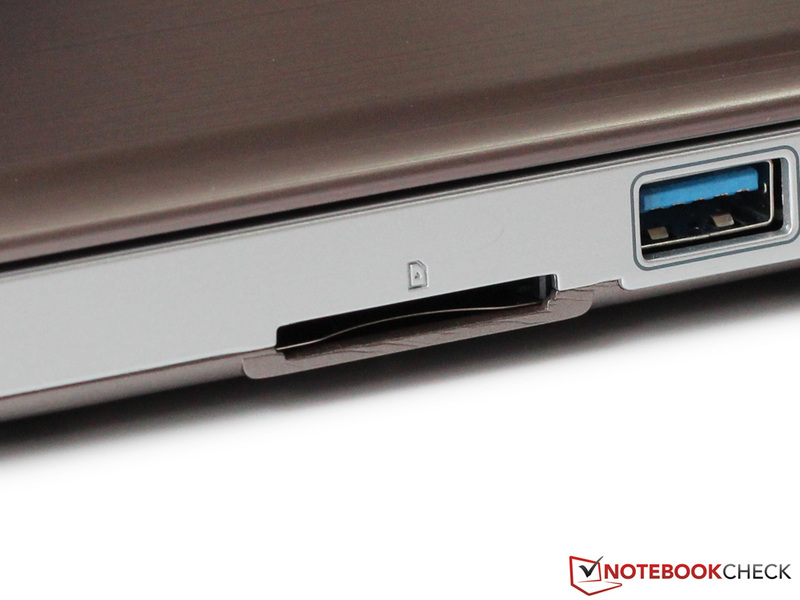 Lenovo's U430 relies on an HDD/SSD cache hybrid solution, and thus achieves 3937 points. Schenker's S413 (4750HQ, Iris Pro 5200) takes the lead not least owing to its considerably stronger CPU: 6365 points. The system subjectively makes a swift impression. The system start is performed in clearly less than 10 seconds; programs and files are loaded and opened in next to no time. Our review sample also differs from the official spec sheet here, where an array comprised of a 32 GB cache and a 1 TB hard drive is specified. 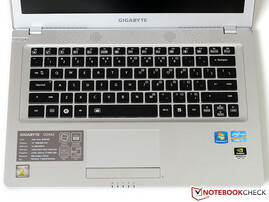 Our review sample, however, corresponds to Gigabyte's U24T configuration listed for Germany, i.e. with a 128 GB SSD and a 750 GB HDD. The advantage of that: the operating system, and the most important programs and files can be stored on the swift SSD, making them available quickly. Other data, such as pictures, videos, or computer games can be stored on the HDD. However, the user has to accept the corresponding waiting times. Nevertheless, this is a good compromise of storage capacity and performance. 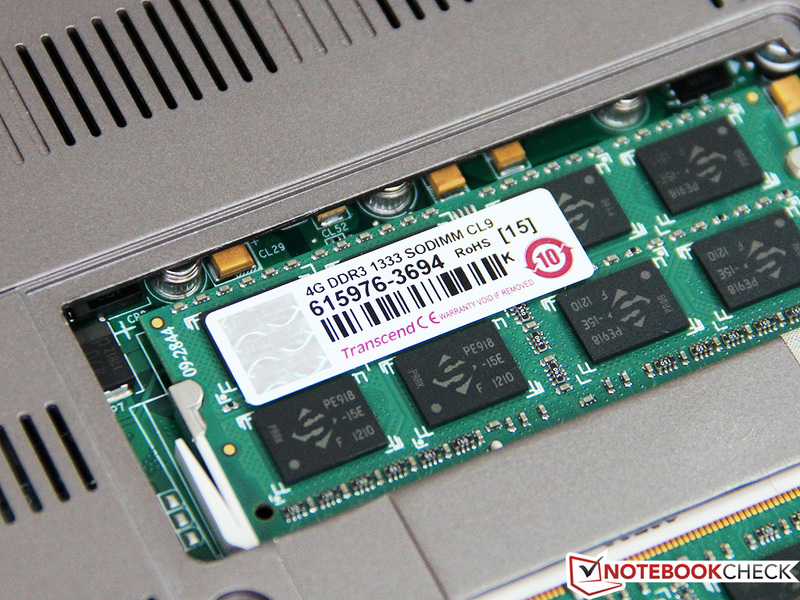 The LiteOnIt SSD is roughly on par with the Samsung 840 series with 519 MB/s in CrystalDiskMark's sequential read test. The storage device, however, falls behind slightly in the sequential write test: 318 MB/s is clearly surpassed by, for example, Samsung's 840 Pro (approx. 400 MB/s). Samsung's SSD 830 series is on par with the LiteOn unit. Gigabyte's U24T can regain ground again in the 4k read test: With 34.2 MB/s, the SSD belongs to the best of its class. The achieved 90 MB/s in the 64k write test is also very good. Overall, the user can take delight in a quite strong storage device should the LiteOnIt SSD be installed in the retail devices. 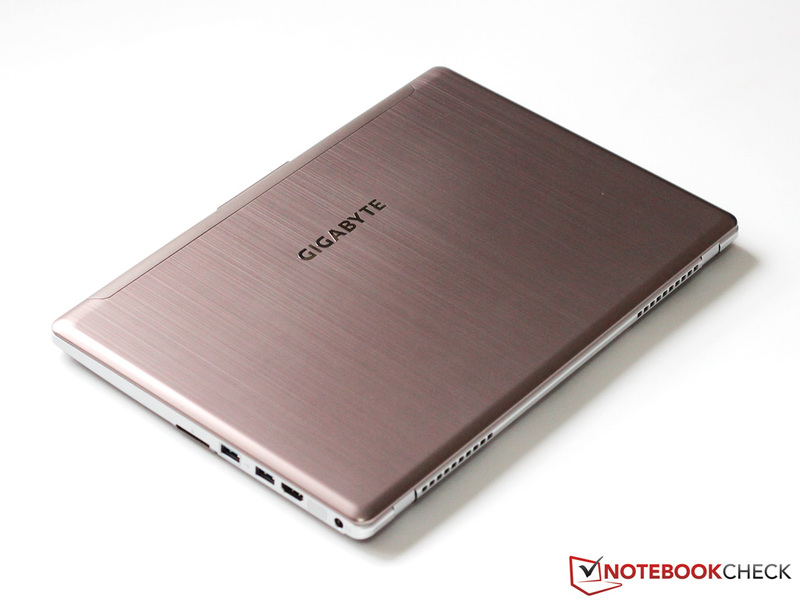 A special feature of Gigabyte's U24T is definitely the GT 750M graphics card that promises a performance plus compared with the GT 730M or GT 740 chips frequently used in mid-range multimedia laptops. 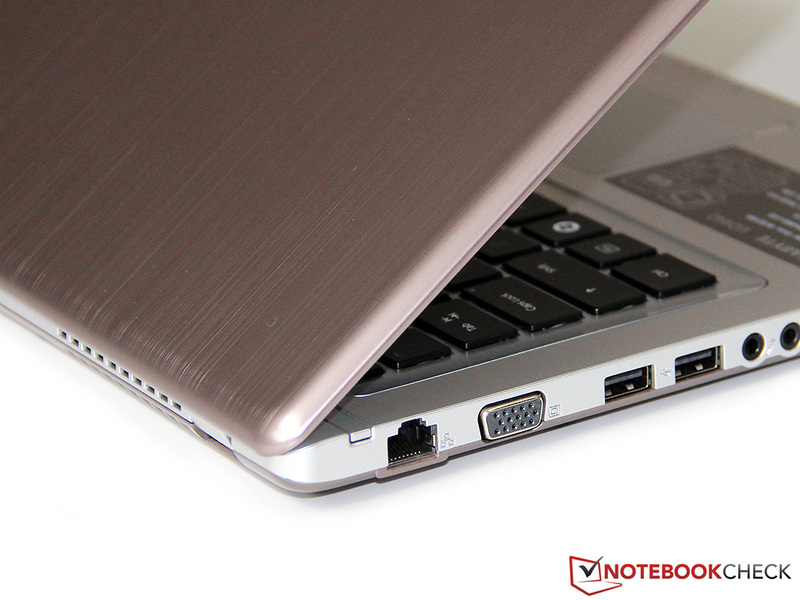 What's more, the laptop can use the CPU-integrated Intel HD 4400 GPU. It is enabled during less demanding office use, while Nvidia's Optimus automatically switches on the GT 750M, unnoticed by the user, in higher graphics demand. Consequently, a favorable balance of power saving and performance reserves is achieved. The GT 750M is available in different expansion stages. 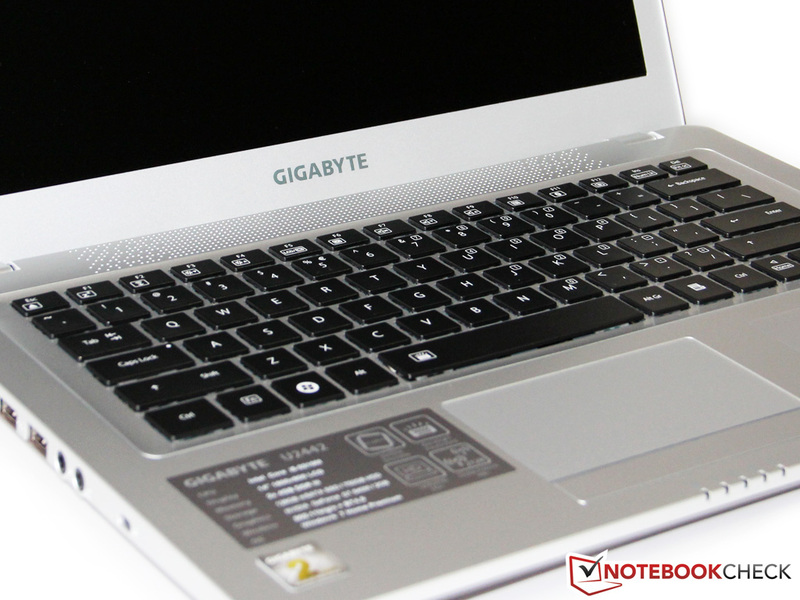 For example, the one in Gigabyte's U24T comes with a 2 GB DDR3 video memory. 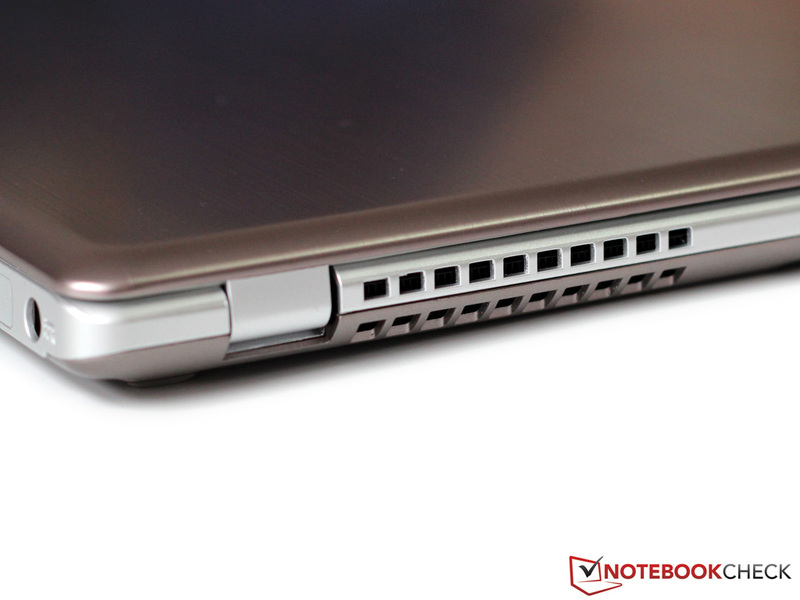 The recently tested Dell XPS 15 featured the full expansion with a GDDR5 memory. Our configuration achieved 2497 points in 3DMark 2011, and is thus positioned among the most different, tested laptops that also sport a GT 750M GPU. Dell's XPS 15, based on the GT 750M's GDDR5 version, still achieves a 20% lead. 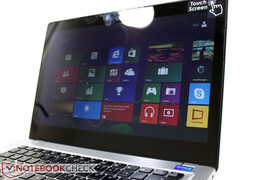 Schenker's S413, with Intel's Iris Pro graphics, only lags behind by 10% in this test. Sony's SV-S14, with a GT 735M GPU, is outperformed by approximately 30%. 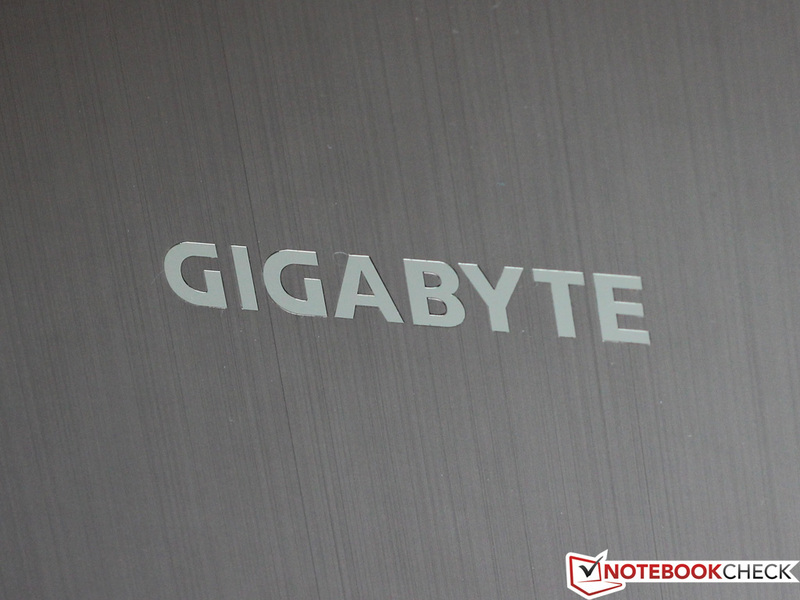 Gigabyte's U2442N precursor, equipped with a GT 640M graphics card, lags behind by about 25%. Gigabyte's U24T achieved a score of 1423 points in the latest 3DMark 2013 Firestrike test. Dell's XPS 15 can even take a lead of 37%; Lenovo's IdeaPad U430 with a GT 740M (i5-4200U CPU) falls behind by a whole 35%. Gigabyte's U24T should have the right hardware inside to render up-to-date games in playable frame rates on the screen with the GT 750M. We tested that with a few current games. We started with Crysis 3. In medium details (1366x768 pixels, medium), we measured an average frame rate of 29.71 fps. Increasing the detail level to high resulted in a frame rate of 21.46 fps. Sony's Vaio F14, with a GT 735M, only achieved a frame rate of 17.8 frames in medium settings. 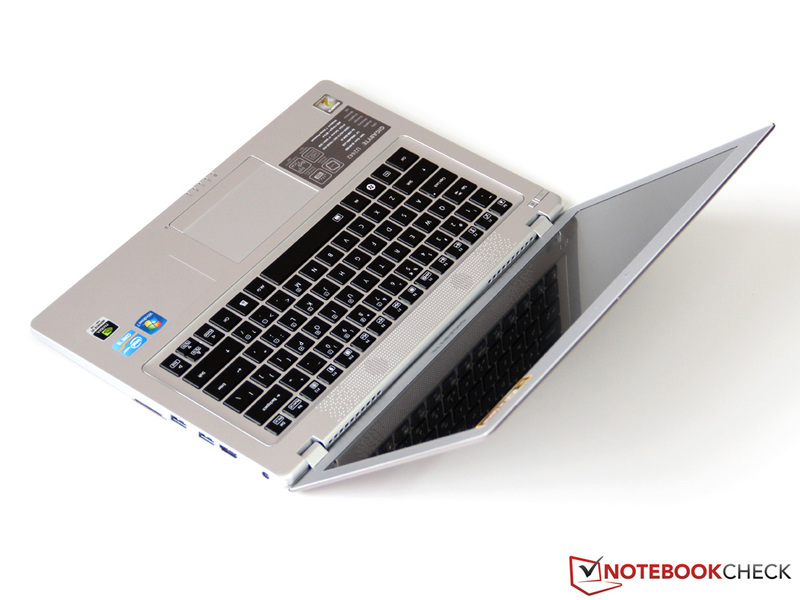 Schenker's S413 is virtually on a par with its Intel Iris Pro graphics. Dell's XPS 15 (GT 750 GDDR5) reaped in a clear lead with 48 fps which equals a plus of 60%. The performance reserves were even enough for high graphics settings in Tomb Raider (1366x768 pixels, high). Again, the XPS 15 took a lead of a good 50% owing to its GDDR5 configuration. 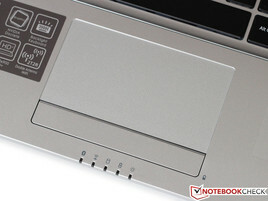 Lenovo's IdeaPad U430 (4200U, GT 730M) only managed 23 fps, which is too little for smooth gameplay. BioShock Infinite is also more modest, and rendered smooth frame rates even in high settings in the benchmark tool. The GT 750M together with the GDDR5 in the XPS 15 accomplished +43% here; Lenovo's U430 again lagged far behind (-35%). Interesting: Asus' N56VB with a GT 740M GPU, but with 2 GB of DDR3 video memory connected via a 128-bit interface, achieved a similar result here. Company of Heroes 2 ultimately brings Gigabyte's U24T back to reality. 28.4 fps in low graphic details were just enough for a few undemanding games. The GDDR5 version of the GT 750M in the XPS 15 only managed an insignificantly better result with 32.8 fps. 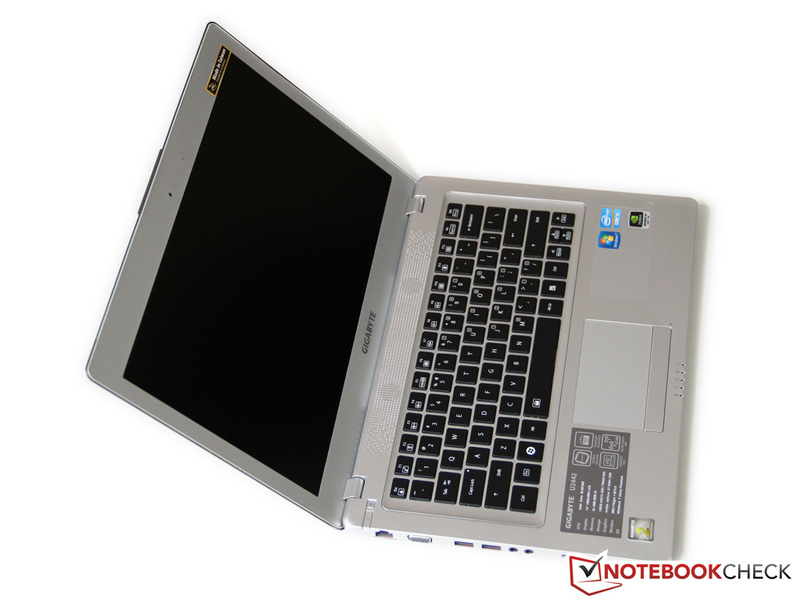 Lenovo's U430 (GT 730M) was within a critical range with 23 fps. 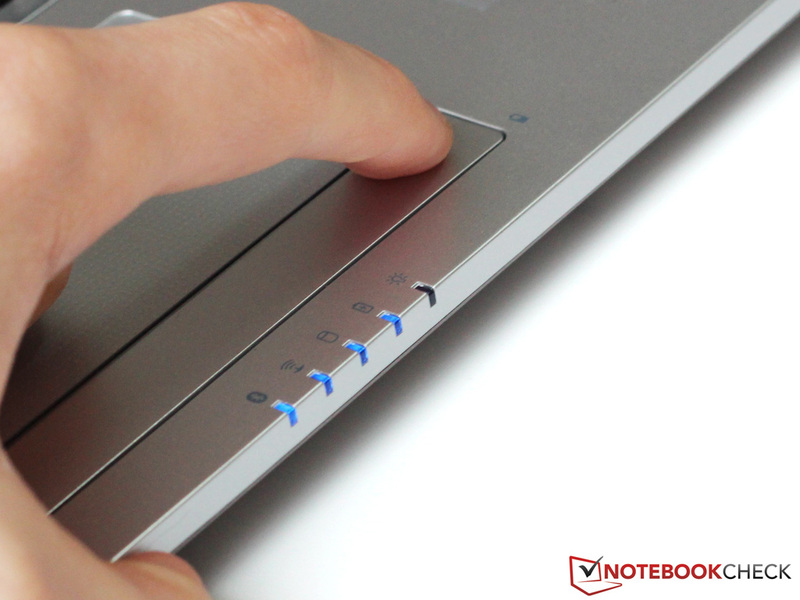 Users can enjoy a quiet device when the laptop is not stressed, and an according energy profile (balanced) is set. The device is, however, never really silent due to the installed HDD's operating noise. We also noticed that the fan responds very sensitively to demanded load. Thus, it might happen that the fan speeds up for a few seconds while browsing. Gigabyte's U24T increases its noise audibly during load because the components inside have to be cooled. We measured peaks of 46.1 dB(A) in medium load (3DMark06), and even 49.1 dB(A) in the stress test when both the CPU and GPU were fully loaded. This will be considerably too much for sensitive users. As usual, we tested the surfaces' temperature development in two scenarios. We noticed a moderate temperature increase on the base, although the wrist rest remained perceptibly cooler. This was also the case during load. 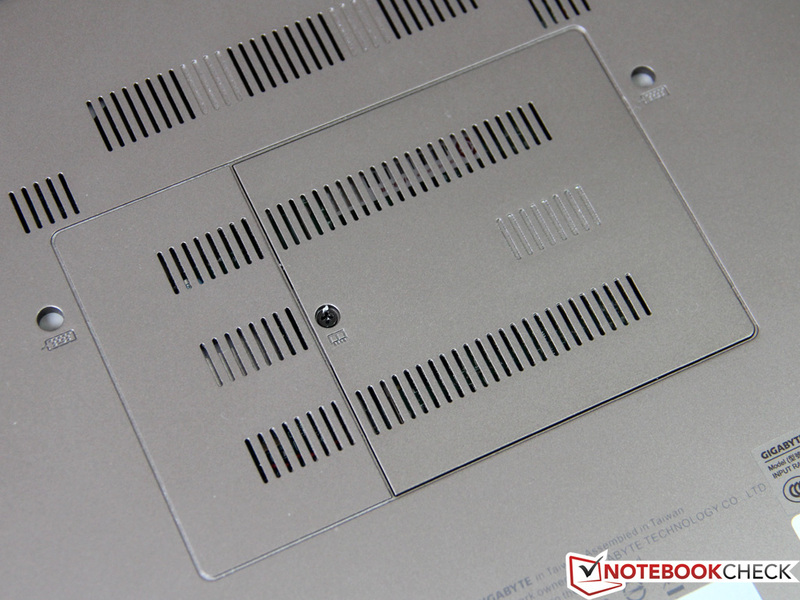 However, the temperatures on the laptop's underside climbed to over 40 °C in some places. The loudly roaring fan does its job successfully here and prevents unpleasant temperatures on the casing's surfaces. The CPU repeatedly clocked up to 2.7 GHz at the outset of our stress test (100% CPU and GPU load). According to HWInfo, the chip's temperature increased to 98 °C, and the CPU's clock was then throttled to 2.1 to 2.2 GHz. The GPU settled to approximately 90 °C with a clock of 1123 MHz. A 3DMark06 test performed directly after the stress test resulted in a very similar score as in a cold operating state. (+) The average temperature of the palmrest area of similar devices was 29.1 °C / 84.4 F (+2.6 °C / 4.7 F). The responsible technicians did not create for themselves a good reputation in terms of sound in the former U2442N model. The present U24T unfortunately continues this production flaw here. Although the installed Dolby software already improves the otherwise absolutely unacceptable sound considerably, the rendered tones are in no way compelling. We have to describe the sound as thin, tinny, and lacking bass. Headphones or external speakers would definitely be recommended. Without load, we measured 9.2 to 12.2 watts at the socket. We particularly deem the rate at the lower end a bit too high. Intel's i7-4500U, as well as the HD 4400 that is active in idle mode, should be very moderate when idling. Thus, the U24T obviously unduly wastes energy somewhere else. 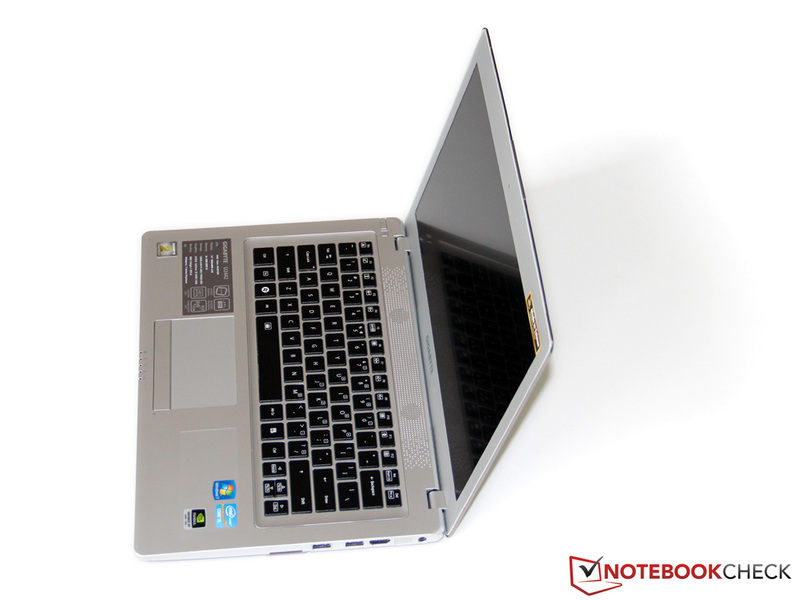 Dell's Inspiron 14, also equipped with an i7-4500U and HD 4400, is satisfied with a minimum of 4.4 watts, just like many other laptops with similar hardware. The laptop consumes around 73 watts in medium load, and only slightly more in the stress test. The 90 watt power supply consequently has enough reserves. 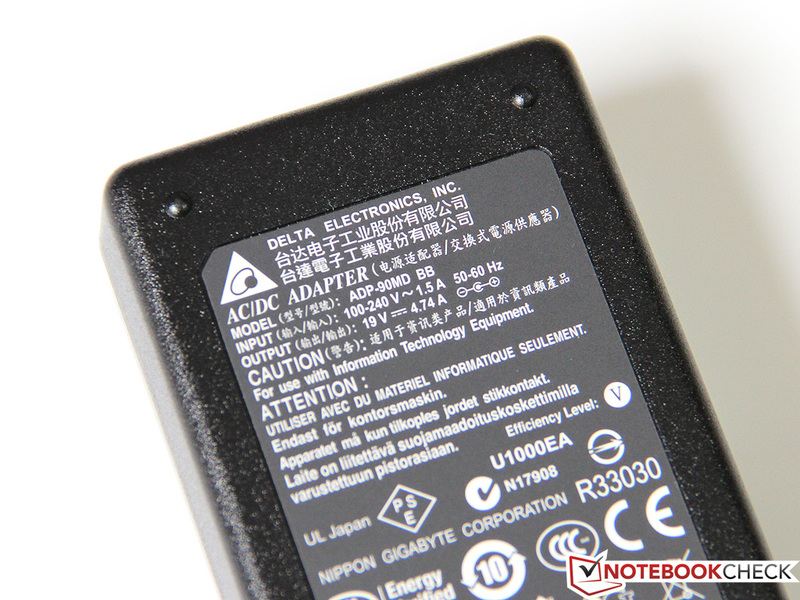 In contrast to the U2442N precursor, Gigabyte has slightly increased the battery power by using a 48 Wh battery. We recorded maximum runtimes of up to 11 hours, and a minimum possible runtime of just a bit over 1.5 hours. The laptop lasted for 4.5 hours in the practical Wi-Fi test with a brightness of approximately 150 cd/m², and where a script automatically opens a website in the browser every 40 seconds. This is an hour longer than the precursor achieved. 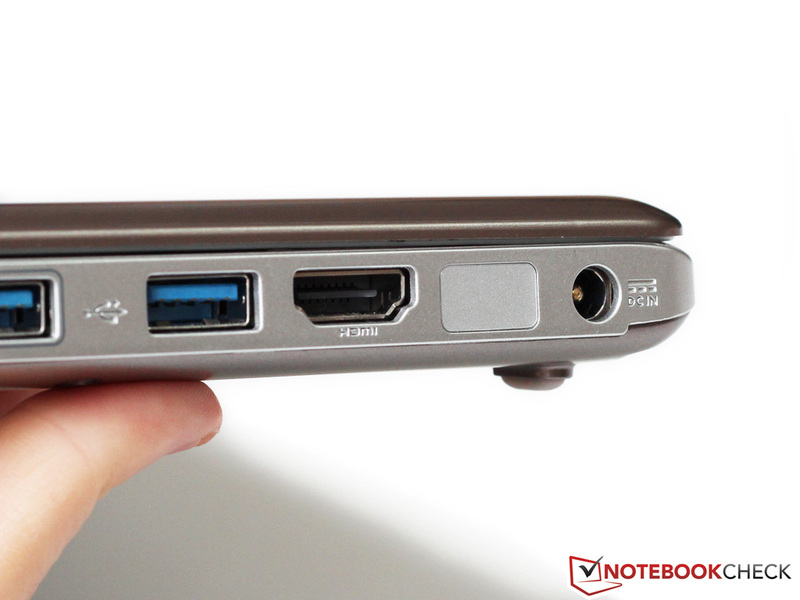 Lenovo's U430 manages a whole hour more, but it also sports a larger 52 Wh battery. The smaller 41 Wh battery in Sony's SV-F14 cannot quite compete with that: just under four hours of runtime. We were not satisfied with the supplied performance-price ratio in the former U2442N, and this has not changed in the present U24T successor. A not quite identical, somewhat weaker U24T configuration is listed for approximately 1299 Euros (~$1779) in various shops. In our opinion, that is definitely too much for the offered bundle. Although the casing is slim and looks good overall, its quality impression cannot compete with some aluminum chassis, or even less expensive devices. The installed screen is inappropriate considering the price. While a resolution of 1366x768 pixels can be justified in a 14-inch laptop, an IPS screen should definitely be installed when a touchscreen is used in the upper-price range where Gigabyte's U24T is located. The screen in our review sample is throughout disappointing: middling brightness, inaccurate color reproduction, and high viewing angle dependency. Considering this fact, it is almost a relief that the U24T version available in Germany is apparently still based on the matte HD+ display used in the precursor, even if it did not score very well in the test. The performance is good. Intel's Haswell ULV CPU alongside the GT 750M graphics solution ensures solid multimedia power, and it is also still enough for a smooth frame rate in the native resolution, as well as medium to high graphic details in many current games. Alternative 14-inch devices can be hard to find, particularly when an extra shot of graphics performance is wanted. 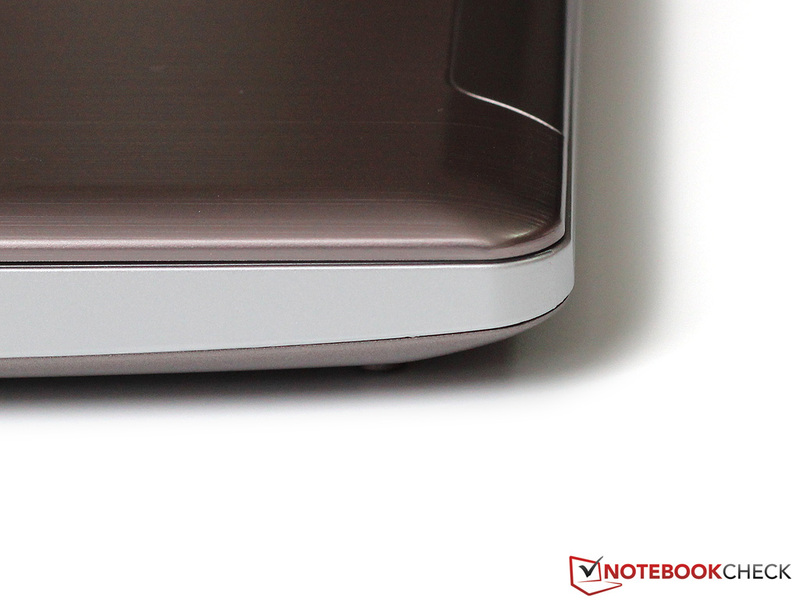 There are considerably more options in the 15-inch category. 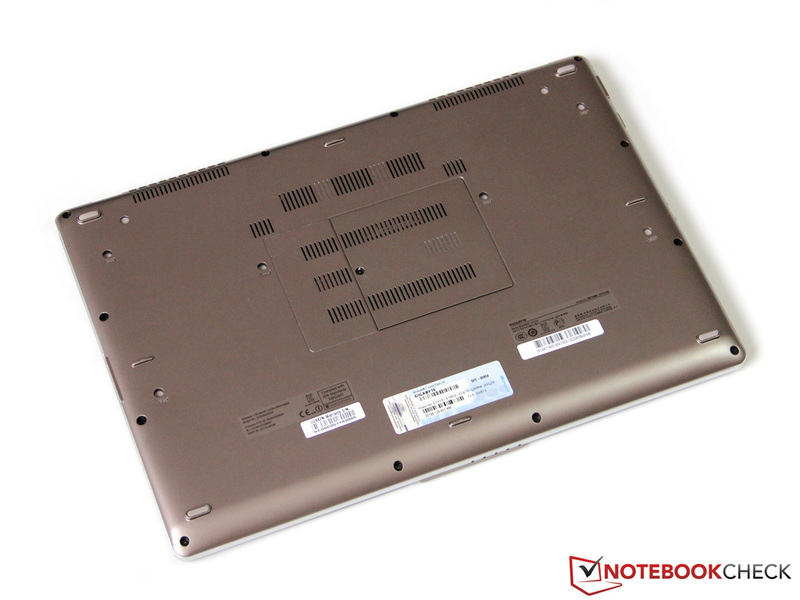 Nvidia's GT 750M is also found in Dell's Inspiron 15, Acer's Aspire V5, or Asus' N550JV. All devices cost considerably less than Gigabyte's U24T. The Aspire V5 would be particularly interesting for bargain hunters because it features a matte Full HD IPS screen for less than 700 Euros (~$957). 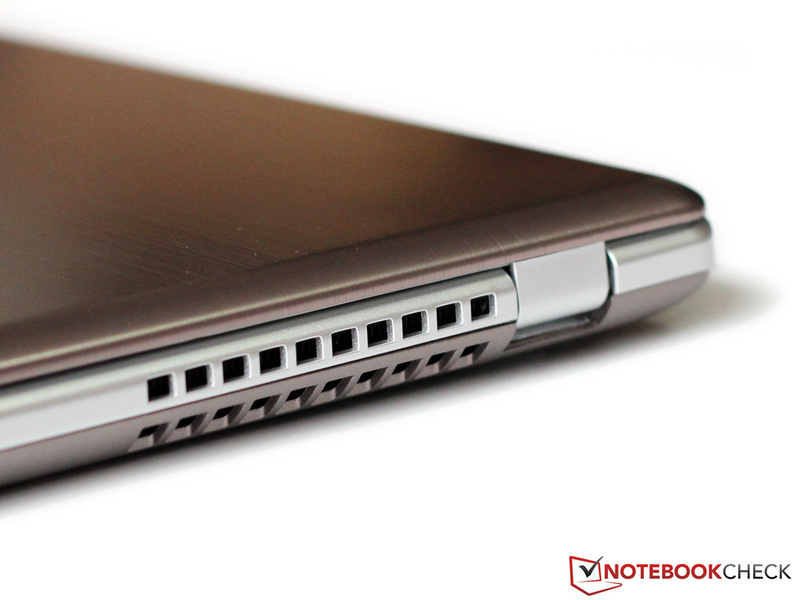 Compact yet powerful - that's what laptops should look like in 2013. For the targeted retail price: simply MORE of everything. A TN HD touchscreen from the bottom of the barrel for 1300 Euros (~$1779). Seriously?